We end the month of June with a review of a tennis game that launched about a week ago. It's Mario Tennis Aces. Does it deliver a stunning serve, or does it hit a double fault? Let's find out.. quickly, as the review tagline sort of gives the answer away. I had great hype for Mario Tennis Aces, as Nintendo was showing a lot of promising features for the game. Unfortunately, I didn't realize that the online tournament and what little of the Adventure Mode that they showed was actually the limits of what content was available in Aces. Nintendo has decided once again to give a drip feed approach to its game, slowly releasing content to a game that isn't fit to be full price. That said, that's not even the worst of the problems Mario Tennis Aces has. What we ultimately end up with in Mario Tennis Aces is a clusterf--k on the court. 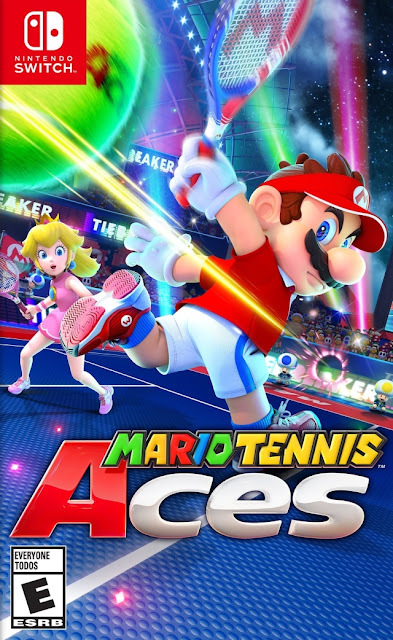 Let's get this out of the way immediately--Mario Tennis Aces is a flawed, unbalanced, nearly broken game. Camelot didn't even try to give players an inkling of balance to be found between characters. This is particularly noticeable when the majority of players use one of the following: Bowser Jr., Boo, Chain Chomp, or Waluigi. Defensive types are pretty much the best in the game due to their ability to cover the court so effortlessly. I'm getting ahead of myself, though. Let's talk tennis. Mario Tennis Aces starts off with a solid enough base, and you can tell that Camelot really tried to freshen up an age old sport like tennis by adding enough new concepts to make it more interesting. In some ways, they have succeeded. As you perform particular moves on the court, whether they be charged shots, trick shots, or regular rallying, you build energy in your gauge. As the gauge increases, you're able to utilize specific techniques with a press of the shoulder buttons, such as Zone Shots and Zone Speed. 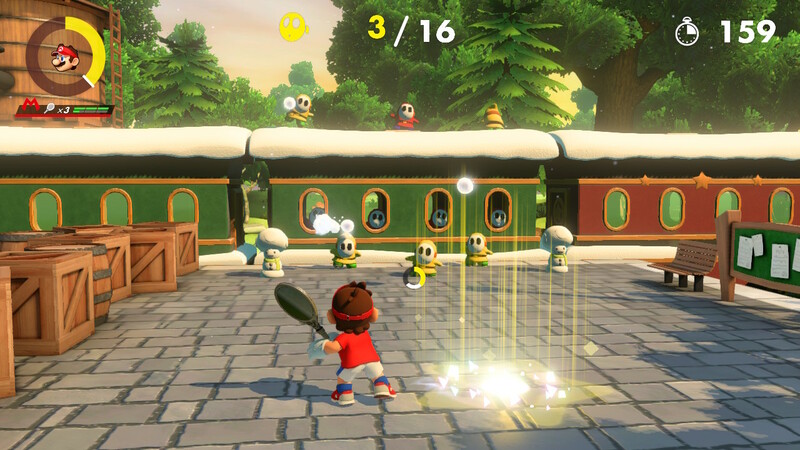 You can perform one of four different types of shots in Mario Tennis Aces. This particular one with a white glow is a quick falling Drop Shot that falls near the front of the court. Zone Shot opportunities open up when the gauge is at least 1/3 full (at least in yellow) and a star shape appears on the court. Simply run up to that spot, press the R button, and then you'll enter a first-person view where you can aim at any point on your opponent's side of the court. Careful, though, as you can accidentally hit the ball out of bounds, which will not only give your opponent the point, but it will also be a waste of your valuable Zone energy. Meanwhile, whereas Zone Shot is an offensive maneuver, Zone Speed is a defensive one, offering the ability to slow down time to reach balls out of your range more easily. It's also pretty much mandatory for blocking Zone Shots and Super Shots without getting your tennis racket damaged or even broken. with the right timing in order to not have his racket take damage. Yes, there's some resource management to be found in Mario Tennis Aces, and this is where some strategy comes in. It's all about keeping an eye on your and your opponent's gauge and managing it properly. Sure, you can spam Zone Speed to reach out-of-the-way shots, but this will consume your gauge, making it so you might not have enough energy to slow down time and block your opponent's Zone Shot. You have a limited number of rackets available to you as well in matches. Without the proper timing during an attempt to block a Zone Shot, your racket will take some damage. Three hits and it's broken--unless it's up against a mistimed block of your opponent's Super Shot (performed by pressing L when one's gauge is completely full), then it breaks immediately. If you are without any rackets left in the middle of the match, you automatically forfeit. What makes Mario Tennis Aces feel completely broken is a mechanic called the Trick Shot. With a flick of the right analog stick, you can perform a quick juke that sends your character moving towards the ball, with the type of shot that they would otherwise have no chance of returning. Now, you need proper timing and you need to flick the stick in the correct direction. The only problem with this is that it's easily abused. In theory, flicking the stick to perform a Trick Shot too early or too late will result in losing gauge energy. However, the amount of energy that is restored on a successful Trick Shot is so substantial that you'll see players online spam the move, intentionally being away from the ball so they can unleash a Trick Shot, gain easy energy, and then spam Zone Shots and Super Shots. The mechanic is smart in theory, but it's totally broken in actual practice, at least as it is now. 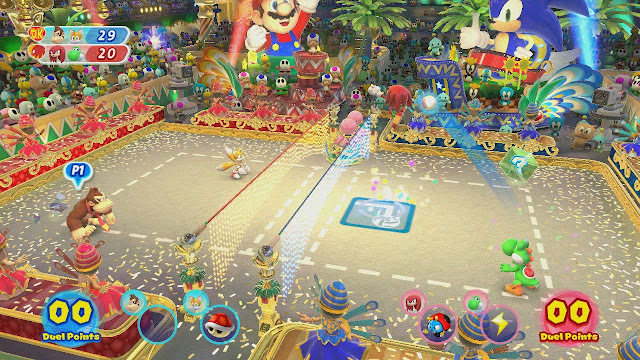 When playing against Defensive characters like Bowser Jr. and Waluigi who already can reach pretty much any ball, it becomes next to impossible to get any ball passed them due to every character's ability to spam Trick Shots. 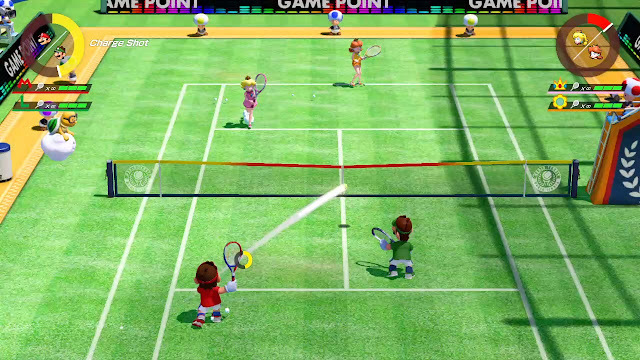 A simple solution would be to lower the amount of energy received from a successful Trick Shot, or better yet, make the window much less generous, but then again, seeing all the other design decisions in Mario Tennis Aces, it seems Nintendo and Camelot weren't interested in making a balanced game of tennis. 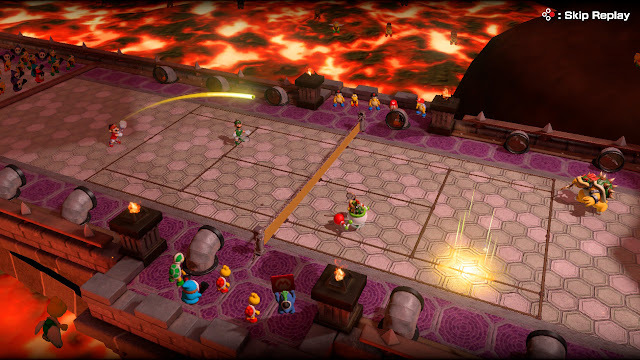 The battle of the obnoxious and unbalanced Defense players, Waluigi and Bowser Jr.! There is a Simple tennis mode, which is your bog standard game of tennis with none of the superfluous and unbalanced rules of Mario Tennis Aces' main form of the sport. 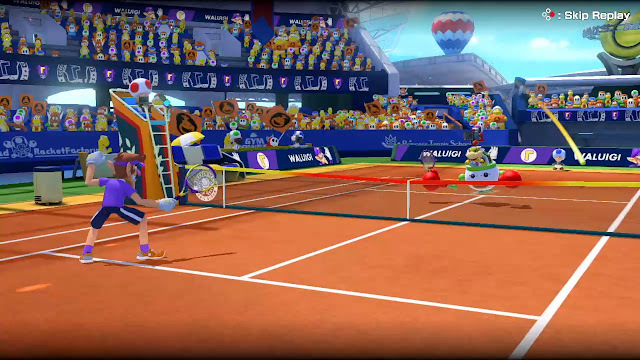 In addition to this, a Wii Sports Tennis-style Swing Mode is also supported, using the JoyCon controller's motion control to play tennis casually against the AI or with friends and family. Just don't presume that you can play online with Swing Mode, as for some baffling reason, you can't. That isn't all with Camelot's baffling decisions with Mario Tennis Aces either. In an immensely stupid and limiting decision, the only types of matches you can actually play online against friends and strangers, as well as offline against friends and the AI, are one-set matches or tiebreakers. Forget pulling off an amazing comeback by being down two sets and coming back to win the next three to win the match, and forget battles of endurance. Apparently, Nintendo knows what you want to play better than you do. The absence of an option to play more than one set, even offline, is just shocking in its stupidity. Furthermore, when choosing a court to play on, you don't actually select a court. Instead, you're forced to select the courts you DON'T want to play on. I mean, why be smart and just let a player choose the exact court they'd like, instead forcing them to uncheck all of the courts except the one they wish to play? Egad! The intelligence of Nintendo and Camelot is on full display here. In addition to traditional Singles play, Doubles play is also an option. Just don't expect to be able to play more than a one set match. What's even more frustrating is that Adventure Mode comes complete with matches against the AI that last longer than just one set. The ability to play more than one set is right in the game, so why can't players do that outside of Adventure Mode!? Speaking of Adventure Mode, any perceived notion that you're getting a meaty single player experience here can be smashed out of bounds like a botched Zone Shot. This isn't your RPG-centric story mode as seen in Mario Tennis for the Game Boy Color or Game Boy Advance. Instead, it's a series of challenges that span a New Super Mario Bros. U-style world map, where you play as Mario (and only Mario) who searches for five elusive Infinity Stones--er, Power Stones. These stones are the necessary components in putting a halt to the master plan of an evil tennis racket that has possessed poor Luigi and, to a lesser extent, poor Wario and Waluigi as well. There are standard tennis matches, mini-games (which is also confusing why these don't unlock for free play outside of Adventure Mode to add SOME kind of extra content to Aces), and engaging boss battles to partake in. One such challenge has you learning how to perform Zone Shots by aiming at snowball-throwing Shy Guys around and aboard a docked train. Mario's about to send some snow into your eyes, Shy Guys! These challenges are indeed fun, but Adventure Mode is over so quick that there's not much substance to be found here. Sure, there's the ability to level up Mario after every match and new rackets to unlock, but these are only good for Adventure Mode. The only main reason to play through Adventure Mode--other than enjoying its limited duration, of course--is to unlock its courts through Free Play. Outside of the brief Adventure Mode, there isn't much left for single player gamers to enjoy in Mario Tennis Aces. There are tournaments to play against the AI, but these don't unlock anything. There aren't even trophy presentations with your characters celebrating their win. It just seems like this game was built on an obscenely low budget, yet this is supposed to be one of Nintendo's big summer games? of the net that can send the ball flying in unpredictable ways. As stated, there are the monthly online tournaments for both standard and simple tennis modes, but the lack of balance online will just turn into great annoyance for most players. When you have to decline matches with the fifth Bowser Jr. you come across in a row--a severely broken character--then you know there's something seriously wrong with the balance of the game. As it stands, the only real reason to do tournaments is to unlock a new character a month early in the game (a character that was already on the damn cartridge in the first place), or you're a glutton for punishment. It can be both as well. a while. Not really conducive to normal tennis, but all court hazards can be turned off, fortunately. Lag was a huge problem in the online demo that was available early this month before Aces launched, but now it's a much rarer occurrence, thankfully. There are still occasional matches that are borderline unplayable with how bad the lag is, however. Fortunately, if you match up with a player and your connection to them is poor, the match will be automatically declined, which is a smart inclusion to a game with little smart design decisions. Mario Tennis Aces is a content-lite, unbalanced, and joke of a full priced tennis game. Somehow even with having a foundation to work off of with the Wii U's Mario Tennis: Ultra Smash, Nintendo and Camelot have released a game that has just barely more content than that sham of a tennis title. The full $60 price tag for Mario Tennis Aces is just salt in the wound and an insult in every sense of the word. If and when Nintendo and Camelot add more features and modes to Mario Tennis Aces, like Nintendo has done with their insulting drip feeding of content in also barren-at-launch games like Splatoon and ARMS, then and only then might Mario Tennis Aces be worth its asking price. As of now, the price gets no "love" from me, and the actual game is hardly any better. 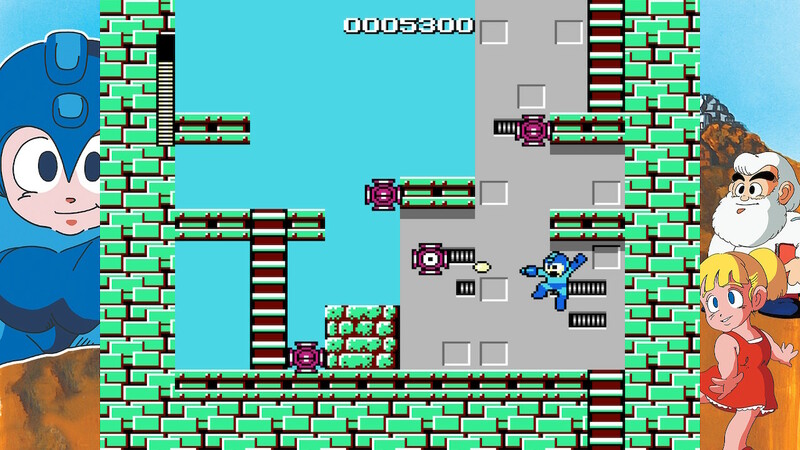 Mega Man returns to a Nintendo home console with a collection of his six NES action-platforming adventures. Mega Man Legacy Collection on the Nintendo Switch gets the SuperPhillip Central review treatment! 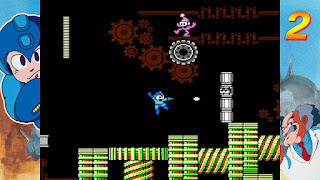 Classic Mega Man has returned home to a Nintendo console in one killer collection. For a long period of time, being a Mega Man fan was incredibly difficult. Between promising games like Mega Man Legends 3 and Mega Man Universe being cancelled and Capcom's apparent hiatus on the franchise, lovers of Mega Man felt left out in the cold. Fortunately, much to my and other fans' delight, Capcom's Blue Bomber sees quite the resurgence in recent years, and 2018 looks absolutely stellar for him. With a new entry in the classic series hitting all major platforms this October with Mega Man 11 and now a duo of classic collections for the Nintendo Switch, Mega Man is back, baby! Released on a multitude of consoles a couple of years ago, Mega Man Legacy Collection finds its way onto the Nintendo Switch with some added features making it the definitive version of Digital Eclipse's collection. If you've never played a Mega Man game before, allow me to elaborate on the series and each game in the collection. For starters, Mega Man as a series is a 2D side-scroller, and every game in the collection originated on the Nintendo Entertainment System and Famicom. You can easily see through playing the game chronologically (those you can play the games in any order, of course) the technical and graphical upgrades each game added to the series. By Mega Man 6, the developers really had a significant handle on the NES/Famicom hardware to create some truly amazing and detailed levels and environments. 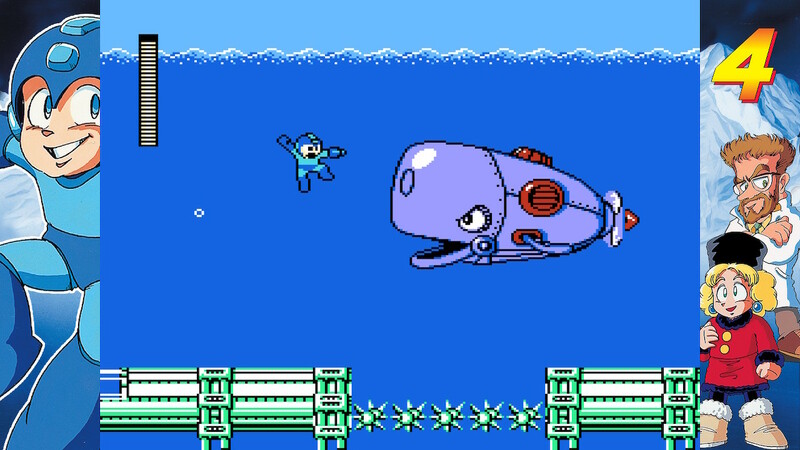 Six games make up the Mega Man Legacy Collection, and there's not a dud in the bunch. At any rate, what made Mega Man great was its combination of action-platforming, running and shooting, and the ability to play through the initial levels of the game in any order you wanted. 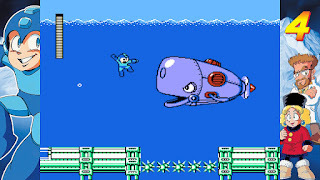 The bosses in each level, the Robot Masters, would give Mega Man their special weapon upon their defeat, and each Robot Master was weak against a particular special weapon. For instance, in the original Mega Man, Cut Man's special weapon could take down Elec Man in less than ten seconds, otherwise it'd be a tough, but not impossible fight to engage in. After the initial eight Robot Master levels (six in the original Mega Man) were complete, a new series of final linear levels opened up for the Blue Bomber to right the villain of the series, Dr. Wily's wrongs. The original Mega Man is my least favorite of the six featured in the Legacy Collection. 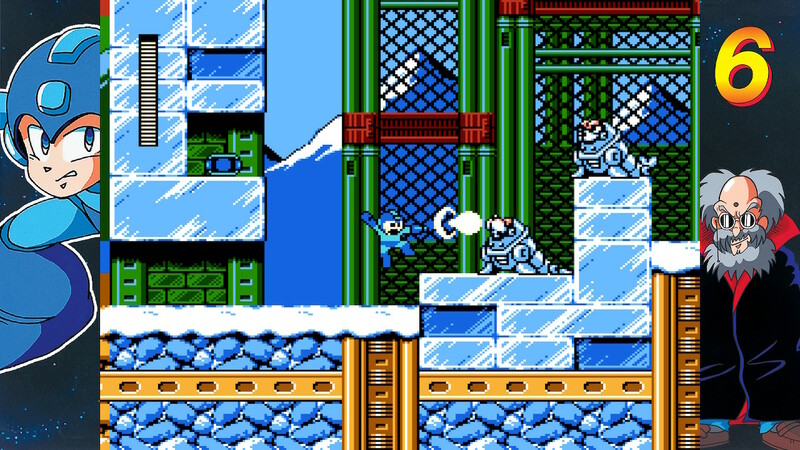 Mega Man's movement is a bit slippery, and things like falling on spikes, no matter if you had invincibility frames or not, meant instant death. The game used a one-time point system that was superfluous at best, and as stated already, instead of your standard eight Robot Masters, only six were featured in the first Mega Man game. I can't say I hate Mega Man, as it's actually a pretty good game, and you have to hand it to Capcom for creating a solid foundation for the franchise to grow, and as we've seen, prosper. Mega Man 2 is one of the most loved entries in the entire franchise, and it really brought some well thought out improvements to the series. For one, a lifesaver at the time of its release, Mega Man 2 has a password system that reveals a password at the end of each level that you can copy down, quit the game, and when you turn it back on, you can insert the code to start back where you left off. Obviously with the collection's save states, this is no longer relevant or necessary, but it was a godsend at the time. 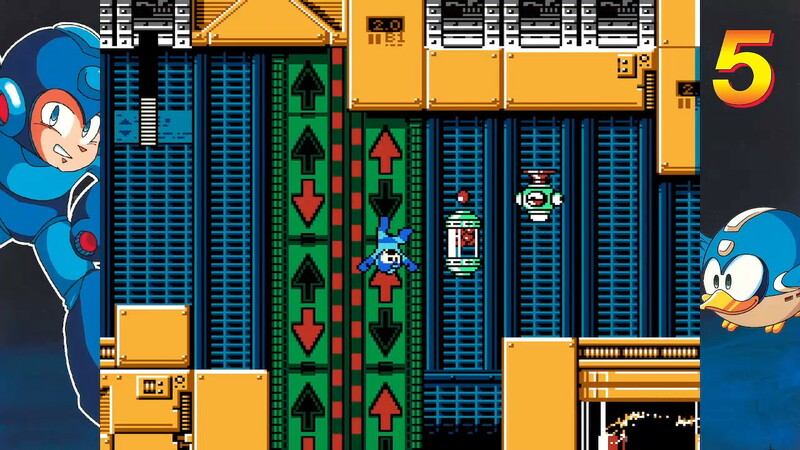 Mega Man 2 also introduced Energy Tanks that could refill Mega Man's health when selected from the pause menu, great for giving Mega some extra health in particular tough boss battles or stages. Meanwhile, Mega Man 3 is probably my actual favorite of the games in this collection. Two of the reasons for this are the introductions of Mega Man's slide maneuver and the character that was brought into this game, Rush, the Blue Bomber's canine companion. The slide meant Mega Man could cover more distance at a faster clip, also allowing him to evade enemy attacks more easily, and Rush was ultra helpful because Mega Man could collect different adapters to use with him. The Rush Coil could Mega Man extra height to reach high places, whereas the Rush Jet could bring Mega Man across long stretches of level by way of the air. 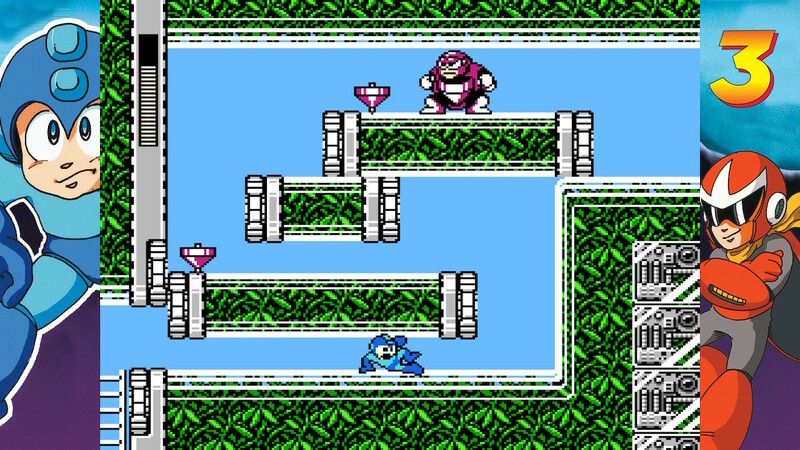 Also, Mega Man 3 was a lengthier game that I feel gets a right mixture of both quantity and quality. 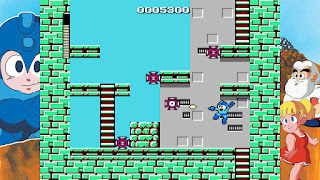 Mega Man 4 gave the Blue Bomber a charge shot in addition to his slide, performed by holding down the shot button and then letting go when the shot is fully charged. The game was made with this new mechanic in mind, making for a re-balanced experience that really shines. Although nothing else major was added to the game, Mega Man 4 still shines as a bright title in this collection that was more about evolution rather than revolution. Mega Man 5 started to show that the series was merely going through the motions. While the quality of 5 is still high, the gameplay pretty much was standard quo, save for interesting level gimmicks such as the changing gravity as seen in Gravity Man's stage, where Mega Man and enemies would shift from walking on the floor to moving along on the ceiling, and Wave Man's stage, where Mega Man could ride a hover cycle across the ocean waves. Some replay value was also added, featuring eight letters, one found in each level, that spelled out MEGAMANV, and would unlock a supportive bird helper character named Beat. Finally, as you'd expect, Mega Man 6 is the most graphically impressive game in the collection. Instead of using Rush as a means to ride, Mega Man in 6 would actually fuse with Rush with a pair of "adaptors", one providing flight and one providing power. Four of the Robot Master levels featured a second entrance to the boss, and getting to this and beating the boss gave a circuit board to the player. When all four were collected, once again, bird buddy Beat becomes available to help out Mega Man in the game. 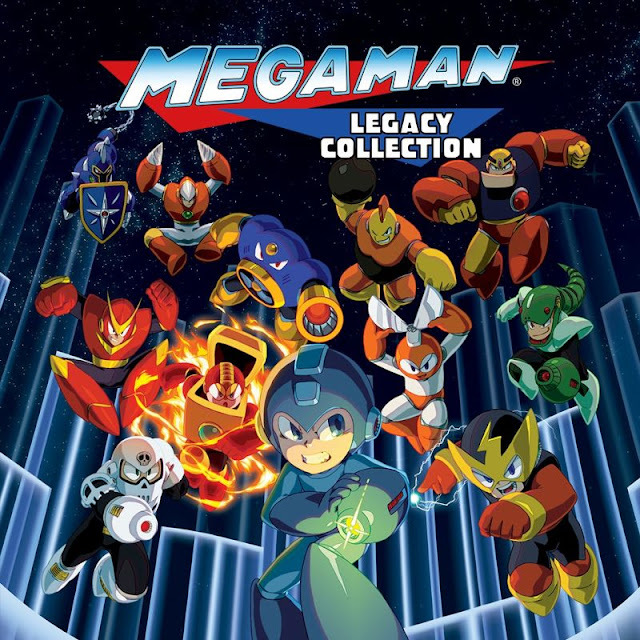 The Nintendo Switch version of Mega Man Legacy Collection comes fully stocked and supplied with all of the main features from the original releases. 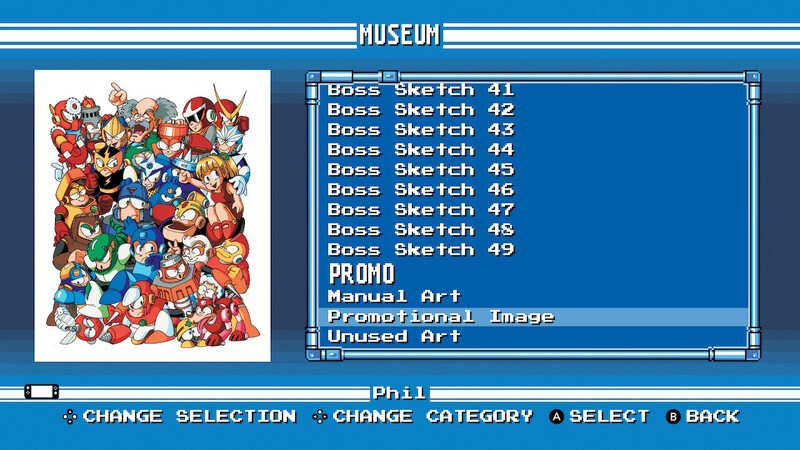 There are art galleries packed with rarely or never-before-seen concept art, advertisements, and box arts for Japan, North America, and Europe, character and enemy databases that reveal enemy and Robot Master weaknesses, and a music player to listen to all of the marvelous melodies and chiptune delights from Mega Man 1-6. The actual games can be played in full screen or surrounded by borders of character artwork, and you can even change the screen filter to get the genuine look and feel of playing on an old school CRT TV. The Museum has all sorts of goodies inside: promotional art, a music player, and an enemy database. Mega Man Legacy Collection on the Nintendo Switch also comes with an optional exclusive feature, the ability to hold the L button to rewind gameplay. This is perfect for times where you misjudge a jump, collide into spikes, or fall into a bottomless pit, allowing you to rewind time and get to a point prior to that unfortunate occurrence. Of course, save states are still present and accounted for. 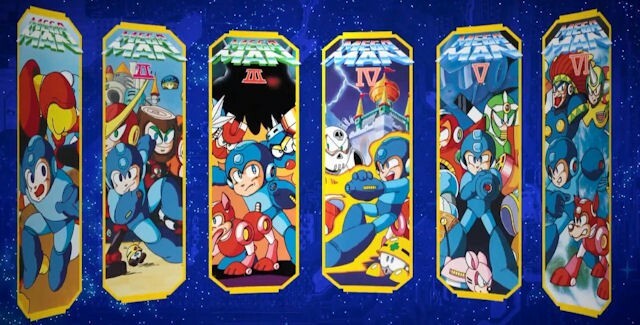 These combined with the rewind feature make for a collection of Mega Man games that all skill levels can complete and enjoy. If you don't wish to use these, you don't have to. It's just a nice option to have. In addition to the six games in the collection, there are also the challenges that were added to the previous versions, taking players through remixed levels and things like boss rushes. As you complete challenges, more unlock for you to flex your Mega Man skills with. Unlike the main games, challenges do not allow you the ability to rewind or use save states. Gotta keep things fair, after all. Furthermore, like the Nintendo 3DS version of Mega Man Legacy Collection, the Switch edition also has amiibo capabilities to use the Mega Man amiibo to unlock exclusive challenges. However, seeing as the actual amiibo is a bit tricky to find nowadays, most might not be able to access this particular bit of content. Mega Man Legacy Collection on the Nintendo Switch provides a pleasant compendium of Mega Man's NES action-platforming adventures that come with enough features to make them worth playing through all over again. Heck, just the games themselves make themselves worth playing through all over again. Added features like the ability to rewind during gameplay makes this the most accessible version of the collection for players, and it's just a quick and lovely convenience for those particularly troublesome sections of the six games. Whether you're a longtime fan of the Blue Bomber or just wanting to get into the series, Mega Man Legacy Collection is a good a collection as any to jump into and experience Mega Mania either for the first time or all over again. SuperPhillip Central heads towards the end of June with a cavalcade of new reviews! This next one is from a Nintendo 3DS game that released last fall. It's Hey! Pikmin, and hey! It's time for SuperPhillip Central's review! Nintendo's Shigeru Miyamoto is one of the most celebrated creators in the video game industry, and it's for good reason--he continually makes amazing games out of simple concepts that most often than not turn into long, thriving franchises. One such franchise is Pikmin, which debuted in 2001 on the Nintendo GameCube, thanks to Miyamoto's own interest in gardening. Since then, three main installments have been released on home consoles, and a fourth game, a bit of a spin-off, is on the Nintendo 3DS as of last fall, Hey! Pikmin. With a developer in Arzest that doesn't have the best reputation with many Nintendo fans, can Hey! Pikmin break new ground, grow, and prosper? Well, in a word, yes! Hey! Pikmin once again sees Captain Olimar's ship, the Dolphin, crash landing on a planet that is mysteriously reminiscent of a certain planet we all live on. (Hint, hint.) With the help of his longtime friends, the Pikmin, Olimar must journey through dangerous plains, caves, mountains, and more to uncover a whole assortment of objects from the wild. These objects are then converted into energy for the Dolphin, in order for it to repair itself and leave the planet with Olimar in one piece. While the way the game sets itself up will be familiar to any Pikmin series player, instead of exploring a three-dimensional environment like in the console titles, Hey! 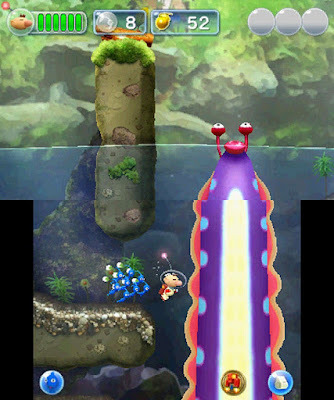 Pikmin plays out completely in 2D through side-scrolling, relatively linear levels. The game uses both of the Nintendo 3DS's screens to display each level. You utilize the Circle Pad (or face buttons for left-handed players) to move Olimar around, and use the stylus to toss Pikmin. 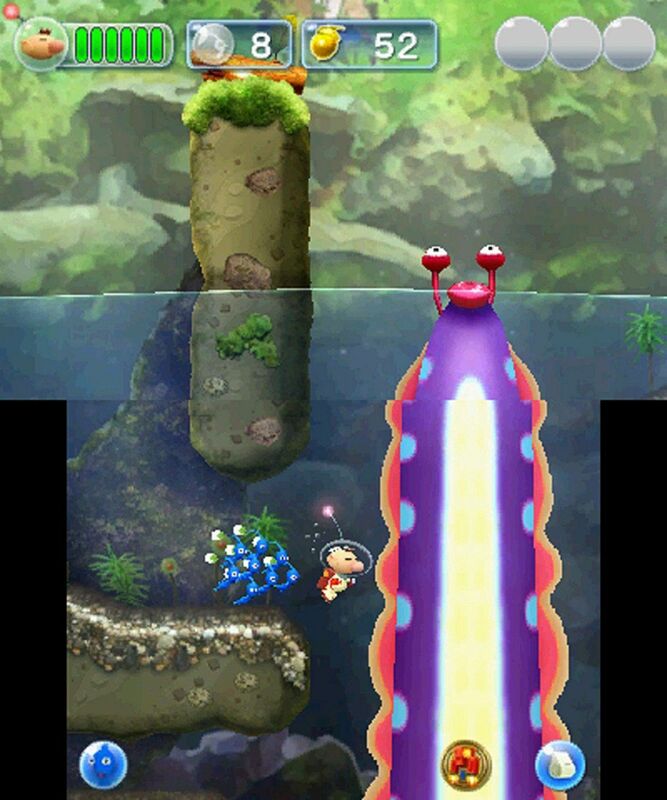 Where you tap on the screen determines the place a given Pikmin is thrown. Pikmin can be chucked at various enemies, objects, and obstacles in order to proceed through levels, and this feels very nice and natural. The precision granted by the stylus/touch controls is great for picking off even the smallest of enemies with little margin of error. Of course, enemies don't just stand still, waiting to have Pikmin manhandle them. Timing is key to tap the screen at the right time and the right spot to successfully throw Pikmin at moving targets, or else they might be over or under-thrown, perhaps resulting in some grisly Pikmin deaths. The enemies of Hey! Pikmin feature some well known buggers for fans of the franchise, but there are also plenty of new, exclusive creatures to contend with. Starting out, enemies are easy to dispatch and take care of, but as you progress through the game, they become more dangerous, offering greater offense and resistance. From oval-shaped birds that aim at your Pikmin pals to an overgrown bug that marches back and forth, intent on devouring any and all potential meals that are foolish enough to stick around in front of it, Hey! Pikmin's world definitely isn't too friendly to Olimar and his squad of helpers. Thankfully, Captain Olimar and the Pikmin are more than capable of fending off any foe or challenge that rests on this perilous planet. Olimar himself has a helpful jet pack that he can use to hover for short distances. This acts as an admittedly clunky way of adding platforming to the game, but the mostly slow and relaxed pace of Hey! Pikmin makes it so the clunky jet pack doesn't ruin the experience. Like the main Pikmin games, each variety of Pikmin has their own usefulness and abilities. 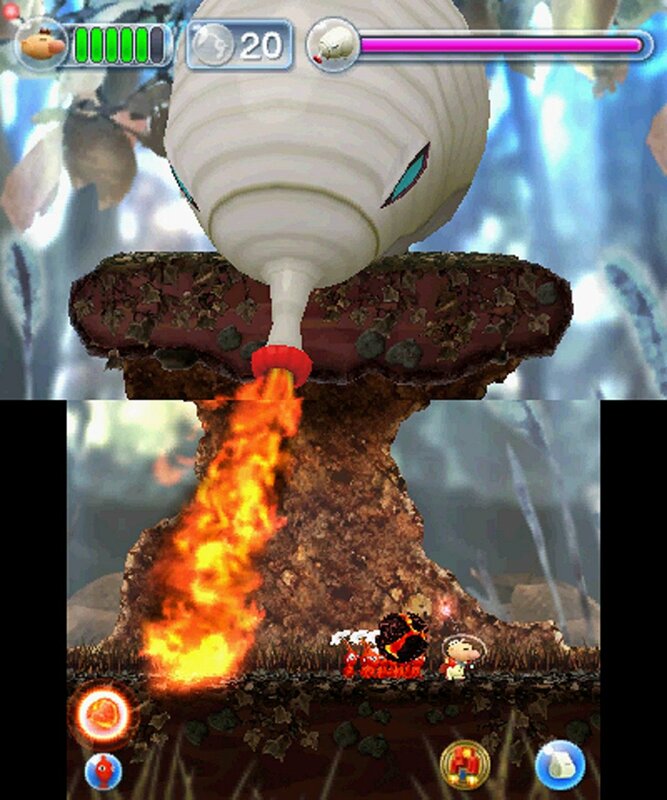 For instance, Red Pikmin are the most common and can walk through fire and flames without being incinerated. Meanwhile, Yellow Pikmin are the lightest of the bunch, able to both be thrown higher than other Pikmin types, and can also defy the dangers of electricity. Blue Pikmin won't drown in water like other Pikmin, swimming and moving freely in the water. Then, there are the strong, crystal-crushing Rock Pikmin and the flying Winged Pikmin to help out as well. 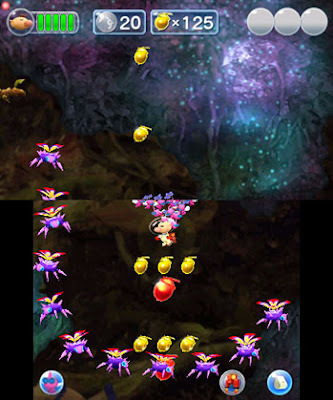 Each type is gradually introduced throughout the adventure, and the game teaches the abilities of the varieties of Pikmin in a steady manner as well through showing rather than telling. 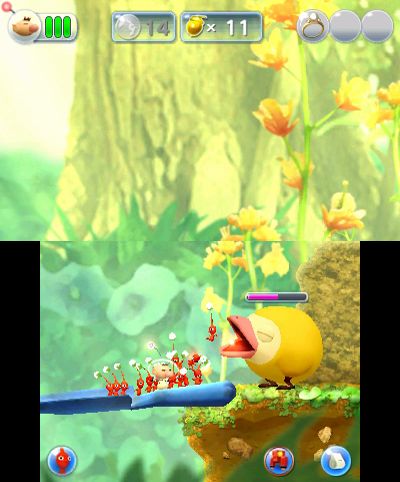 This is done through cute, animated scenes when Olimar comes across a batch of Pikmin in levels. Not only entertaining and adding personality to Hey! Pikmin, but also a great tutorial as well. Fortunately, not all of the Pikmin's abilities are revealed through these scenes. Some things you stumble upon yourself--particular uses of the Pikmin--and these moments really shine brightly in the game. Hey! Pikmin isn't too difficult of a game in general, especially if your goal is to just go from the start of levels to their end. However, if you're exploring levels for objects to collect, there's more of a challenge to be found. This challenge is even greater if you want to collect all 20 Pikmin in a level without having any of them perish. Some levels are quite tricky to accomplish this task, and it can get very annoying proceeding through a level only to have a Pikmin get gobbled up or otherwise die at the final enemy or obstacle before the goal. The reward for completing all levels in the game this way is minimal at best, but it's an extra way to challenge yourself and add even more replay value to this 9+ hour game. If that doesn't do it for you, then each level's hidden areas and secret exits leading to unlockable levels can extend the fun of Hey! Pikmin, as well. Hey! Pikmin's eight major sectors of 5-6 levels each (including a generally pleasing and interesting boss battle at the end of each sector) feature some smart level and puzzle design. Yes, I just said "smart level and puzzle design" when it comes to a game developed by Arzest. Hell hath frozen over. Regardless, levels where you explore a flooded cave that requires emptying its water for your Pikmin to be able to pass through, descend downward through a cavern where your Winged Pikmin carry you as you control your descent, avoiding enemies and hazards on your way down, and speed down a snowy series of slopes on top of a bottle cap as you fling Pikmin at enemies and deadly rolling snowballs alike, all offer excitement and nice variety. Many of the passages, pathways, and areas leading to treasure have some nicely designed puzzle sequence to solve as well. One had me throwing Pikmin onto a sardine can in order to weigh it down and lift up the platform Olimar was standing on. Then, I could move Olimar over to where the treasure was located after figuring out how to raise up a second sardine can by correctly positioning his Pikmin squad in place. Many times I would be playing Hey! 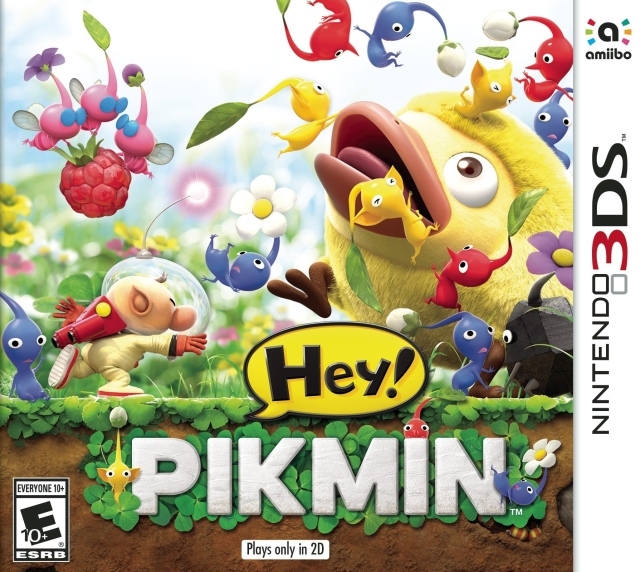 Pikmin and get a revelation as to how to interact with an obstacle in the game, or even realize that I could use this Pikmin in this particular way. Another reason that avoiding treasure (which amounts to just ordinary everyday objects to people like us) is a negative is that you'll miss out on reading all of the incredibly clever descriptions of objects that Captain Olimar stumbles upon and makes note of in his journal. For example, a combination lock for a locker is described by Olimar as an ominous vault of sorts, complete with foreboding countdown. These entries of both objects and enemies are fun reads, and they add even more welcomed personality to Hey! Pikmin. What isn't so welcomed is Pikmin Park, which seems like a throwaway mode in the main story of the game. Here, you send Pikmin off to various locations in the park to dig up Sparkium, the energy Olimar's rocket requires to escape the planet. However, the process is so slow and the rewards are so small in comparison to simply going through levels and collecting treasure, that it really feels somewhat worthless in the grand scheme of things. Eschewing the more photo-realistic take on the visuals as seen in the home console, mainline entries of Pikmin, this 3DS spin-off has a more watercolor look, sort of similar to Yoshi's New Island. However, here it's more impressive with more appealing colors and lighting. With the use of both screens as the playing area, the stereoscopic 3D isn't available in Hey! Pikmin. Furthermore, even when the action isn't intense, some frame-rate issues occur. This is nothing that spoils the game by any means, but it's important to mention. Meanwhile, the sound side of Hey! Pikmin sports a soundtrack that is probably my favorite out of all the Pikmin games, I found myself humming and bobbing my head a lot to the music in the game, and the familiar sound effects of the Pikmin hustling and bustling brought a smile to my face. In a time where the Nintendo 3DS is winding down, Hey! Pikmin stands as a successful experiment for the Pikmin formula. Controlling Captain Olimar with the 3DS's Circle Pad while commanding his Pikmin with the stylus and touch screen is absolutely stellar. Hey! Pikmin is a terrific conversion of the series's gameplay from 3D to 2D, offering an entry that keeps the franchise feeling fresh. It might not be the Pikmin 4 that many of us have been waiting for, but Hey! 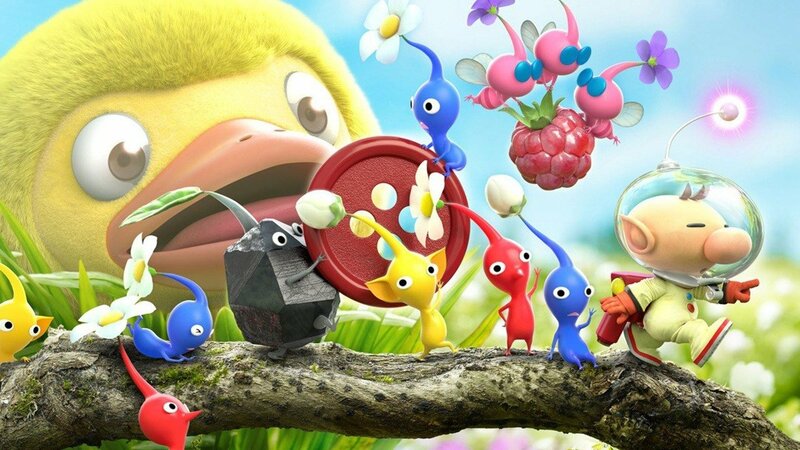 Pikmin succeeds at being a great addition to Shigeru Miyamoto's anything-but-garden-variety brain child. Wednesday night at SuperPhillip Central sees us coming down with a curse! 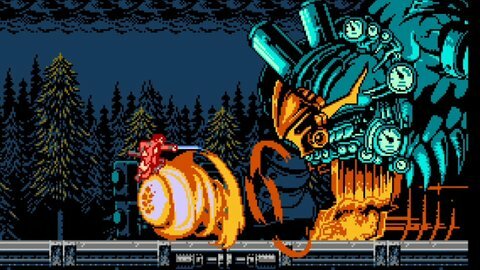 But thankfully for us, this is the good kind of curse, an excellent game from Koji Igarashi of Castlevania's Metroidvania entries, and Inti Creates of Mega Man Zero and Azure Striker Gunvolt fame. When these two creators collide, what we get is an excellent homage to Konami's classic franchise with Bloodstained: Curse of the Moon. Here's my review. Koji Igarashi's Bloodstained: Ritual of the Night, a spiritual successor to his directed Castlevania games, successfully saw itself reach its funding goal on Kickstarter. One of the sub-goals for the game was an 8-bit prelude to Ritual of the Night that would play like the classic NES Castlevania games--whereas Ritual will be in the Metroidvania style. This game, Bloodstained: Curse of the Moon, has since launched on all major platforms, and while it comes off a greatly more than just an homage, fans of retro gaming and old school difficulty alike will find something to love about it. 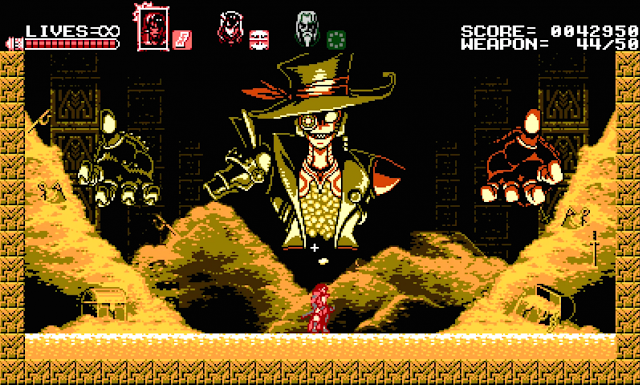 Bloodstained: Curse of the Moon finds the main character, Zangetsu, cursed by a demon. In a tried and true formula, he sets out to strike down the demon which bestowed the curse to him. Along the way, he quickly gathers three other comrades, each with different abilities to assist in getting through the game's eight levels. It might not be the Vampire Killer, but Zangetsu still whips it, whips it good. Zangetsu is the standard, all-around character with great attack strength and sizable enough health. Meanwhile, the other trio of characters each possess something unique to serve their uses. For instance, Miriam has a long whip that can easily cut through foes several spaces ahead of her. Her ability to perform a high jump means she can access areas that Zangetsu cannot. She also has a slide move to get through tight spaces. Then, there's the magician Alfred who is limited in his abilities due to low health and a lack of melee moves allowed to him, but his spells deal plenty of damage. Finally, there is Gebel, who might as well be Alucard. He slings bats at enemies to attack them, and can even turn into a furry, flying rodent himself to cross over gaps. Of the four characters, he's the only one who cannot gain access to or change special attacks. Alucard--I mean--Gebel unleashes bats from inside his cape to take down enemies. The levels of Curse of the Moon take place in all kinds of interesting places--from a rain-drenched ghost ship to a sand-showered pyramid. These are linear affairs, but the replay value is beefed up through the notion of alternate paths, which there are plenty of in each level. Most can only be accessed by one of the character's unique abilities, and some paths are harder or easier than others. Occasionally, having a certain character for a path is mandatory if you wish to reach areas otherwise inaccessible to the other characters, usually housing goodies in them like health, magic, or defense upgrade. Without Miriam and her ability to slide, this magic upgrade would remain untouched. Character management is important, too, as once a character loses all of their health, falls down a pit, or otherwise perishes, they're unavailable to you until the next level or when you lose every other character--whichever comes first. Thankfully, you can switch between characters on the fly with the shoulder buttons, so if one character is low on health, you can swap them out for another whose meter is better filled. Each level concludes with an engaging and enjoyable boss battle that pits your team of demon-slayers against a powerful foe, where pattern-memorization, careful planning, adept dodging, and precise timing are all key to survive and escape with your life towards the next level. Most bosses employ some sort of desperation move after their health has emptied, using their last breath to try to take you out with them. While most of these attacks are thankfully not one-hit death deals, it can be a little unfair to not know what kind of health-deteriorating attack a boss is going to hit you with, sometimes resulting in you dying at the very conclusion of battle only because you couldn't have possibly foreseen what was coming. A small gripe, but a gripe all the same. The first boss is one feisty furnace that Zangetsu is about to send to the repairman. 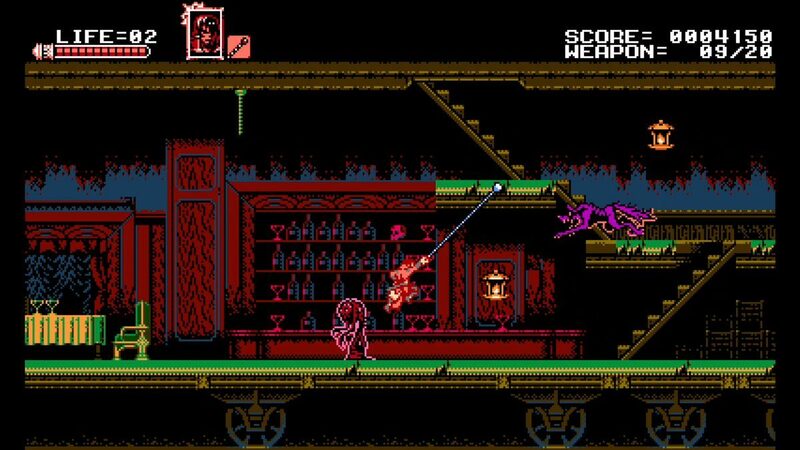 Curse of the Moon doesn't quite reach "NES Hard" levels like the classic Castlevania games, but it is challenging nevertheless. You can make the game as hard or as easy as you'd like by virtue of two main difficulties. There is Veteran, the standard difficulty that limits the amount of lives you start with (though you can find 1-Ups hidden in levels) and causes your character to get knocked back upon taking damage. Then, there is Casual, which is a much easier difficulty that gives you unlimited lives (though characters can still die and not be able to come back until you start the level over and complete it) and no knock-back from enemies and hazards whatsoever. I strayed towards Casual mode to give myself a more relaxing, less strenuous time, since my Castlevania-styled skills don't hold up like they did for me as a kid (nor as someone with much less time and patience), but even then, Curse of the Moon holds a pretty stiff challenge, nonetheless. Even still, simply beating the game once won't give you the full story. There are multiple modes that unlock upon reaching the initial credits, such as one that follows directly after the events of first completing the story. Then, there's a mode where you can play through the game solely as Zangetsu, killing each character you'd normally team up with in the story to take their special power and attempt to beat the game that way. Other than that, there is also a Boss Rush mode which is one boss after another until the final showdown. 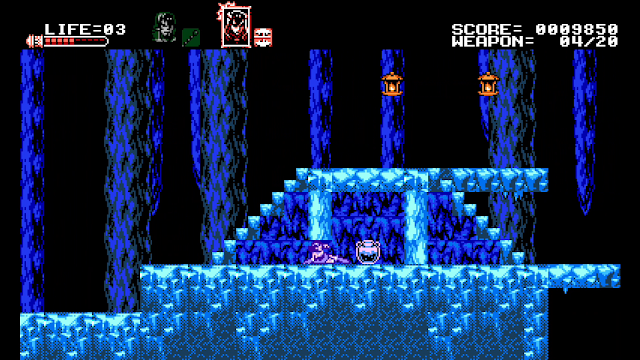 Whereas this particular boss is one gold rush away from a serious and total beat-down. Bloodstained: Curse of the Moon is a satisfying appetizer to the upcoming main course that is Ritual of the Night, that succeeds in delivering a classic Castlevania game in all but name. Perhaps the game strays a little too closely to Konami's NES trilogy, but it's a wonderful, awesome homage all the same. Some might find the controls a little too unforgiving, with how the game forces you to dedicate yourself to your characters' jumps (i.e. 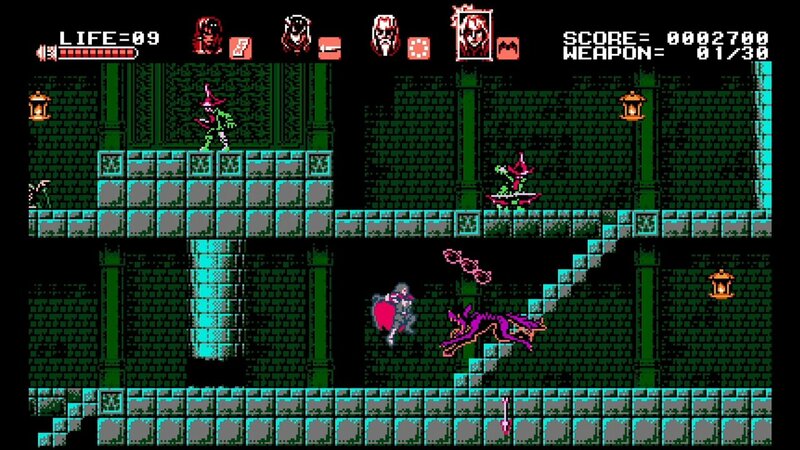 no midair course correction), but for everyone else yearning for a retro-inspired Castlevania in new franchise clothing, Bloodstained: Curse of the Moon is the game for you. It's by no means cursed to mediocrity. In reality, it's far from it. If you've been around SuperPhillip Central for a while now, you're probably well aware that I have a strange fixation on underrated/overlooked gems when it regards video games. Couple that with my love for video game soundtracks, and you have the impetus for why I came up with this series of articles, now at its seventh part. On this edition, we're taking a look and listen to games like ARMS, Sonic Forces, Everybody's Golf, and more! Our first underrated game and soundtrack for part seven of this recurring series of articles is ARMS, a game that like a certain recent Nintendo game, also launched with the bare minimum of content. No doubt this caused many critics to slam this aspect of the game. Thankfully, a stream of steady content came ARMS players' way with new characters, stages, modes, and features to enjoy. This was on top of the already superb fighting-based gameplay. This wasn't your daddy's fighting game--that much was certain with ARMS' unique perspective, approach, and method of fighting. Many of the themes heard from the game play off the main theme of the game, and man, is it a great one! 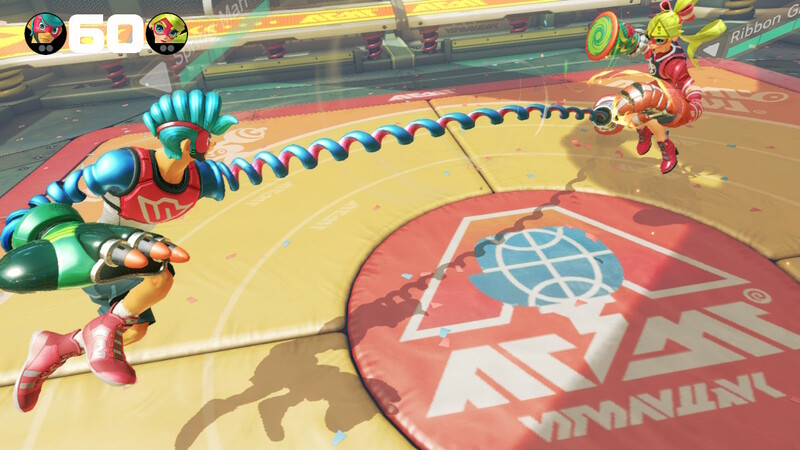 Now that ARMS is fully featured after all this time, maybe we can hope that a certain tennis game that launched this past Friday gets the same TLC given to it. Releasing on both the Nintendo Switch and New Nintendo 2DS and 3DS (note the "New" in there--the game won't work on standard 2DS and 3DS systems! ), Fire Emblem Warriors was maligned for various reasons, whether rightfully or not. 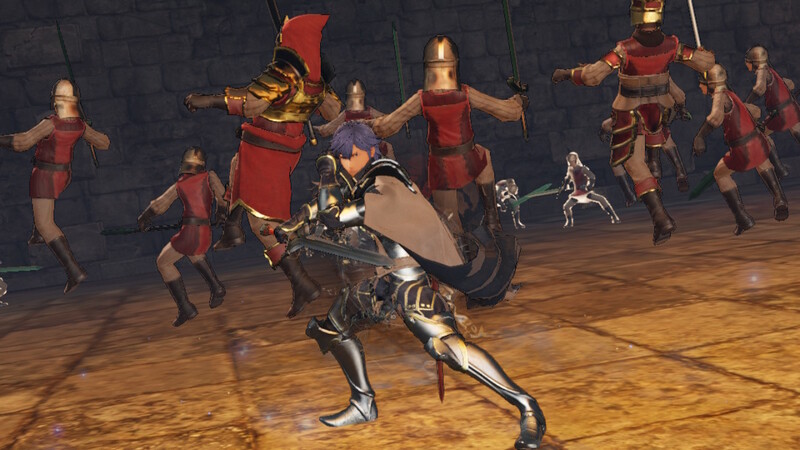 From the character selection that leaned too heavily to modern Fire Emblem games, to the relatively basic maps and Dynasty Warriors-style combat that is deceptively not deep enough for some, Fire Emblem Warriors didn't brighten the day of some reviewers and Fire Emblem fans. As someone with a loose interest in the franchise, I happened to think Fire Emblem Warriors was a solid effort and ended up putting over 50 hours into the game. Though, quantity time with the game does not indicate quality, of course--just a lot of free time during the holidays. What really rocks about Fire Emblem Warriors is its inspired remixes from past games in the series. Even without knowledge of some of the games (due to missing out on them), I still loved every piece of music in this Musou edition of Fire Emblem. Sega's composers really know how to bring it--no matter the game. Heck, we've seen--er--heard that with even Sega's weakest efforts, and yes, some of those are, in fact, games featuring the company's mascot, Sonic the Hedgehog. That continues with Sonic Forces, a soundtrack that I originally didn't find much enjoyment to be found through the samples shared by the Sonic the Hedgehog social media account. Listening to the majority of the tunes during the course of gameplay eventually made me come around to the entire soundtrack. Well, almost the entire soundtrack, as I'm not the hugest fan of most of the faux-Genesis sound chip style Classic Sonic themes in the game. But the vocal themes for your avatar and the standard rock of the Modern Sonic levels? I certainly liked listening to them. 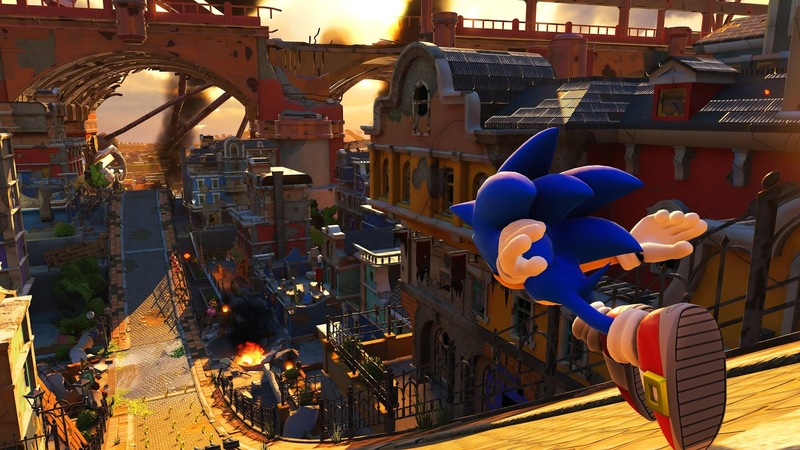 Sonic Forces may be a quick game to beat, but it doesn't outlast its welcome. It also features enough longevity to keep players coming back for more for those who were entertained during their experience with the game. 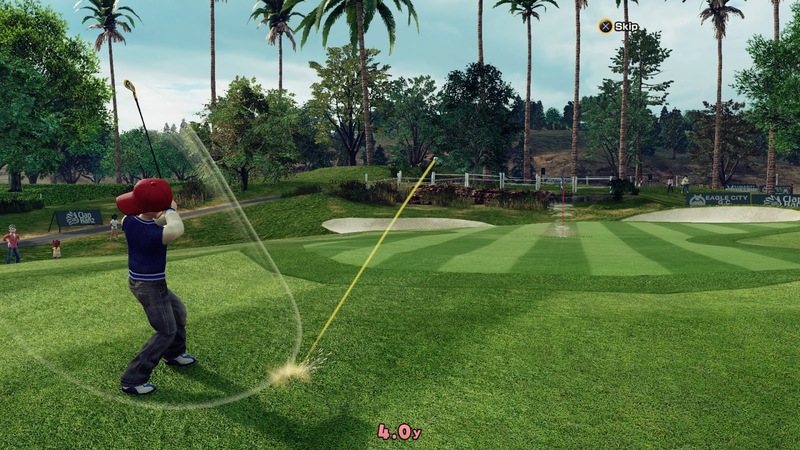 From a super speedy game to a more relaxed, slower-paced one, we turn our attention to Everybody's Golf, the latest in the long-running series that debuted on the original PlayStation--though the series was known then as Hot Shots Golf in North America until this PlayStation 4 entry which unified the name worldwide. Everybody's Golf broke new ground in the series, featuring the ability to traverse freely around an interconnected course, split up between the front nine and the back nine. The soundtrack is so mellow and marvelous that I often found myself just standing still on a given course with my custom golfer just bobbing my head to the tunes as they played. If you've yet to check the latest installment of the Everybody's Golf series, you really should, especially with the game's budget price. Bomberman, Bomberman! Does whatever a Bomberman can! His return last year with the Nintendo Switch launch title Super Bomberman R was quite the blast, and it has recently--as of this month--seen a release on the PlayStation 4, Xbox One, and PC. Each of these ports have their own exclusive character to play as in multiplayer, in addition to the bombers already in the game. 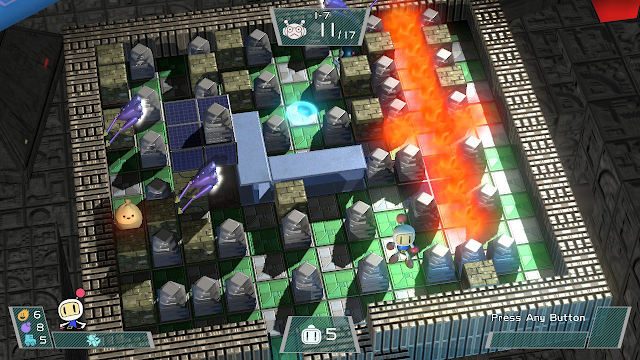 The game was a bit of a mess on the Switch, but with consistent and invaluable patches and updates, Super Bomberman R is now a massively entertaining package on Nintendo's hybrid platform. You can thank us launch Switch owners for being the beta testers, PS4, Xbox One, and PC players! The actual game delivers all the bombastic and bomb-tastic thrills one would expect from traditional Bomberman games, and the music is catchy enough to make bombing runs all the more explosive. Pairing up two former mascot rivals from the Nintendo vs. Sega golden years of classic gaming sounds like a dream come true put on paper, but interested parties didn't quite get what they wished for. Instead of a platformer or action game, Mario and Sonic took their rivalry to the Olympic Games way back in 2008, and almost every two years after, they continued this. Mario & Sonic at the Rio 2016 Olympic Games appropriately brings some inspired Mario and Sonic theme remakes, but what really wowed me were the bright, colorful, and jovial percussive and brass-featured original songs in the game. Rather than name a bunch of remixes that you've probably already heard before, here's some fantastic tracks from the game, both Rio-inspired and some just plain rockin'. With Octopath Traveler's impending release next month, Nintendo of America has revealed its television advertisement for the game. Promised to be a 60+ hour epic RPG, Octopath Traveler is shaping up to be a modern classic. Which character's path will you try out first? Mario Tennis Aces released on the 22nd, and rest assured, you can be certain that SuperPhillip Central will cover that game with an in-depth review. In the meantime, let's take out the Review Redux machine and churn out another second take on a past game I reviewed. 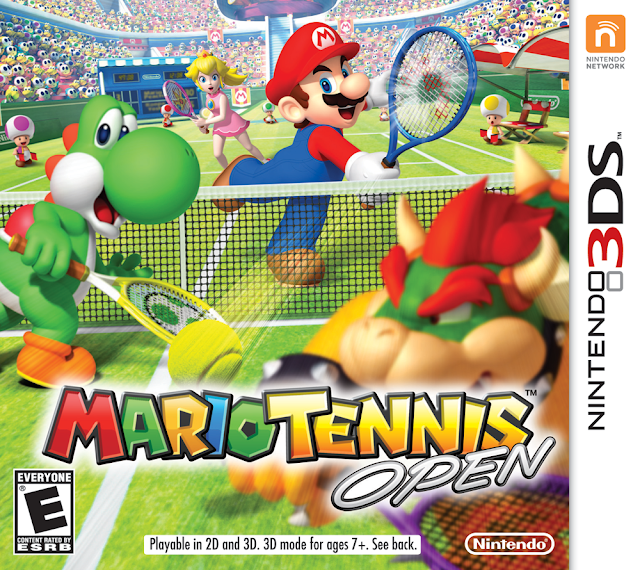 This time around, I'll be looking at Mario Tennis Open for the Nintendo 3DS. Fitting, no? Not just because of Mario Tennis Aces, but also with Wimbledon coming up. Mario just got served. ...But that's a good thing. In my feverish anticipation for Mario Tennis Aces for the Nintendo Switch (since released this past Friday), I wanted to return to a previous Mario Tennis game that I had easy access to. 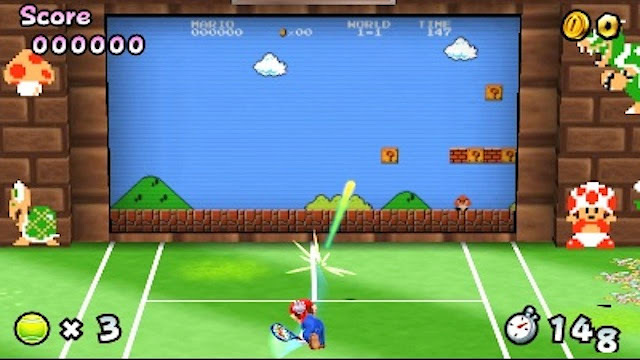 Mario Tennis on the Nintendo 64 was a no-go since the system is in storage. The GameCube's Mario Tennis also suffered the same fate. I wasn't too interested in the more RPG aspects of the Game Boy Color and Game Boy Advance entries in the series, and Mario Tennis: Ultra Smash on the Wii U? Hahaha--no. Thus, the answer was obvious. 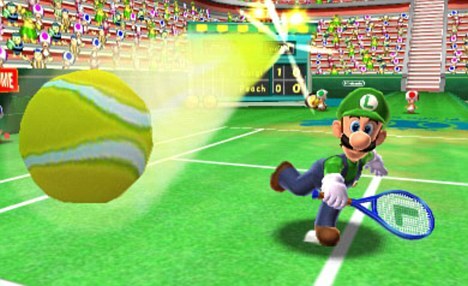 Back when it originally released, Mario Tennis Open drew great ire from fans and critics alike. Sure, it wasn't roasted to tennis hell, but it didn't unleash a winning serve to most players. The reason for this was the Chance Shot gameplay system. As rivals rally the tennis ball across the court, occasionally colored circles appear where the ball is set to land. By pressing the appropriate button to let loose the appropriate shot type, the power and intensity of the shot would be amplified considerably. 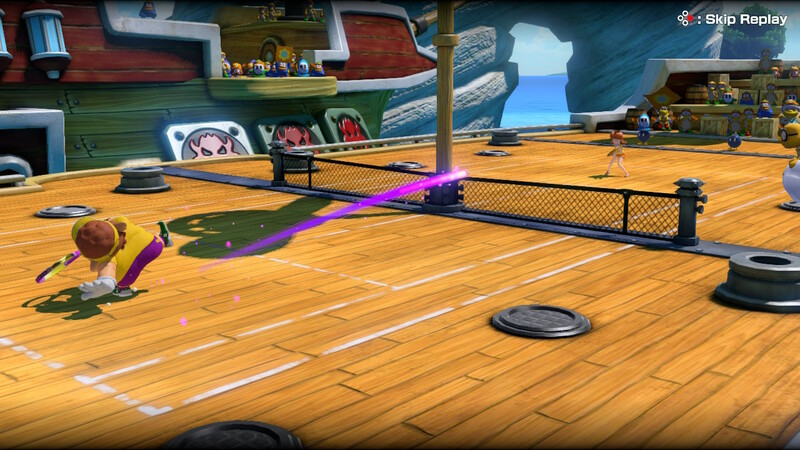 A red circle means to hit a shot with topspin for a powerful strike that can send your opponent stumbling backward. A blue circle means to hit a slice that can curve so much that it seriously defies the laws of physics. Purple is a strong flat shot, yellow is a lob, and white is a drop shot. that sticks close to the front of the opponent's side of the court is incoming. Now, while this can be considered a game of Simon Says--running from side to side of the court and rallying shots according to the color of each circle--you really won't get anywhere against tough, clever opponents, even the ultimate difficulty of the AI, Ace. There is a whole strategy and psychology to Mario Tennis Open. Do you forgo charging up a lob to perform a drop shot, or do you start to charge for a lob, charging up the yellow circle in the process, and hit a flat shot at the last second to completely throw off your opponent? 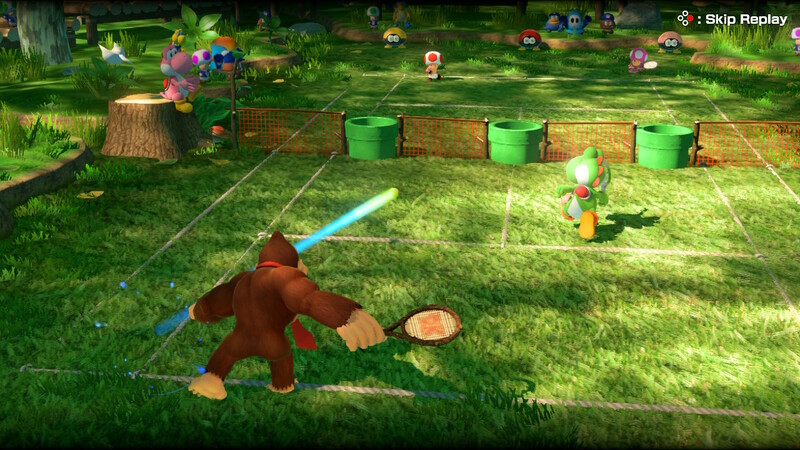 There's more to Mario Tennis Open than a simple game of Simon Says. While that will work on beginners, it's not recommended against ace players. 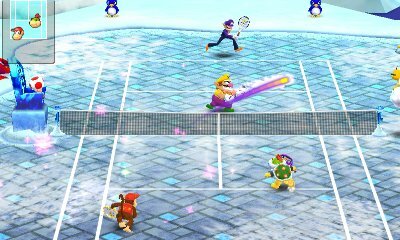 Mario Tennis Open features a satisfying amount of single player modes, which offer a fair bit of variety to them. 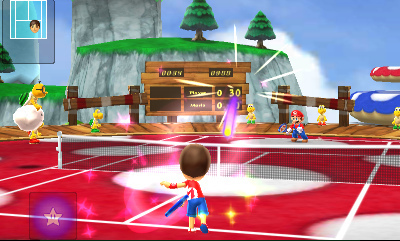 As with most Mario Tennis games, the main mode is Tournament Mode. This pits you against a series of three matches in a row in various tournaments in order to win trophies. The tournaments increase in difficulty (as well as how many sets you must win) as you go along, and there are both Singles and Doubles tournaments to participate in. Winning the fourth tournament with a given character unlocks their Star version, a more improved iteration of that character, complete with better stats. Thankfully, you need not play all four tournaments continuously to unlock a Star character. Merely unlocking the fourth through normal play will allow you to start from it, and once you win the championship, the character you're using will obtain their Star version. This is great, as otherwise there would be a ton of grinding to be done through the laughably easy starting tournaments against mind-numbing opponents. Here's Luigi's ball in your eye! Wait. That came out wrong. That said, grinding is there to be had, if you so desire. After each match you play offline, a new piece of gear becomes available for purchase in the Clubhouse shop. This gear equips to your Mii with a varied and wide selection of available goodies to randomly unlock after each match and purchase. These come in the form of tennis rackets, outfits, wristbands, and shoes. Each of the dozens of purchasable gear affect your Mii in various ways, altering shot speed, power, angles, character movement, and more. Outfit your Mii and then take your custom avatar to the court. I mentioned some grinding to be done. Well, this is where it comes in. In order to purchase gear from the Clubhouse shop, you need coins. Baffling enough, you can only coins through playing the four mini-games available in Mario Tennis Open, as well as StreetPass matches. The former features multiple level challenges ranging from rallying a ball through rings for points, to a really novel and cool mini-game where you hit a ball off a wall that displays a side-scrolling level a la the original Super Mario Bros. Your ball can hit blocks, enemies, items, coins, pipes and so forth to earn points and additional time to clear the level. 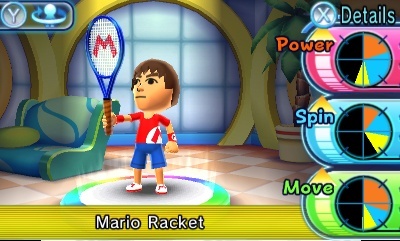 It's by far my favorite mini-game ever seen in a Mario Tennis game. Meanwhile, the StreetPass battles earn you more coins as you get consecutive victories against AI-controlled Miis you've met through StreetPass. Considering the 3DS is very much winding down, it can be difficult to find another local player who has a 3DS and this game in their StreetPass log to exchange Miis with. Why one doesn't earn coins from winning regular matches in Exhibition, Tournament, or Online is just silly to me and a questionable design decision. 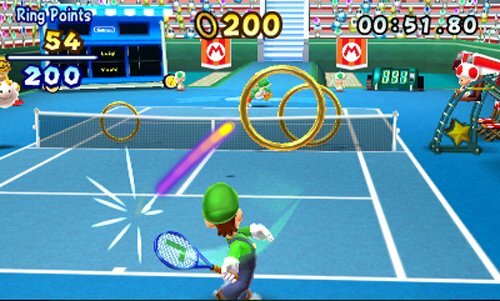 Ring Shot and Super Mario Tennis are half of the available mini-games in Mario Tennis Open. Since I just mentioned it, online multiplayer is available in Mario Tennis Open, and it's fairly limited in what you can do. It's simple tie-breaker style matches against friends or random players. With the latter, winning or losing boosts or lowers your ranking. Winning also bestows you with a Victory Medal, which has no other uses than bragging rights and a way to unlock up to three Mario series-themed Mii costumes. Playing online can be quite vexing with a now-limited field of players available, meaning waiting for a match can take a while. Furthermore, if you aren't using your Mii or a Star character, you will pretty much be handing tougher opponents the match. Personally, I would have liked to see separate matchmaking for Mii and traditional Mario characters. Of course, the bare minimum was all that Nintendo and Camelot concerned themselves with. Ooh! That shot is ice. Er... I meant "nice"! ...I'll see myself out now. I talked about Mii costumes, and these are things that kept me coming back to Mario Tennis Open--well, that is, unlocking them. By completing in-game achievements like winning tournaments, earning a specific amount of Victory Medals, beating an Ace difficulty AI opponent, and so forth, you earn full costumes based on Mario characters and enemies alike. There are over 20 to unlock, and some of these take serious skill and/or patience to gain access to. 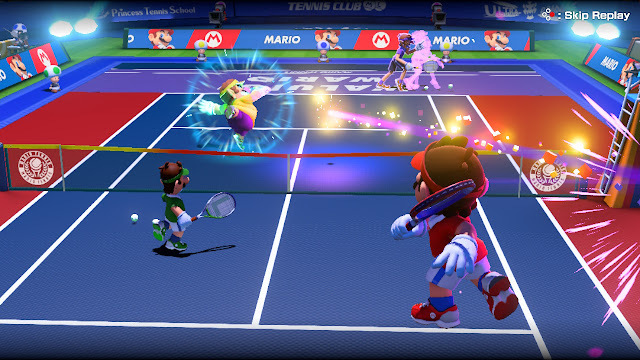 Aside from Mii costumes, there are four unlockable character to reveal and play as--all unlocked by playing and beating the third level of each of the mini-games in Mario Tennis Open. Mario Tennis Open is a better game than I gave it credit for when I originally reviewed it, and even then, I was pretty satisfied with Camelot's Nintendo 3DS effort. I think the court variety--from participating in an exciting rally atop a giant toadstool to a rumble in the jungle--is one of the Mario Tennis series's best, and the character roster is quite good, too. 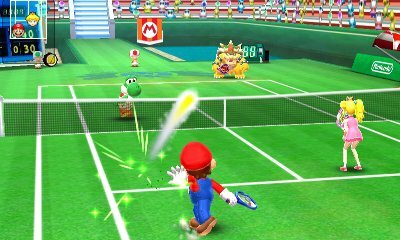 Perhaps offering an optional simple mode without Chance Shots would have made Mario Tennis Open a more palatable entry in the series for many, but as is, Mario's 3DS round of tennis serves up a stellar deal of fun.